Rated 2 out of 5 by tjcj from I would suggest this for beginners only. Not challenging if you play Match 3 games all the time. Especially boring after just finishing the latest Jewel Quest. I deleted the trial after only playing for three minutes. Rated 2 out of 5 by hop0409 from Not fun :( I didn't care for the, for lack of a better term, handling. I couldn't tell when I was clicking on a fruit and I really wasn't clear on the power ups. The game moves a little slow for me. Rated 2 out of 5 by smilesmiley from Booooorrrring!!! This game would be better if it was challenging. The fact that you have to wait before making a new move, just drives me insane. I like fast-paced, challenging games and this is NOT one of those. This game would be good for a child learning their shapes. Rated 2 out of 5 by jzarg from Too Slow! Shameful, the idea is cute, but not well executed. Biggest problem, waiting for the board to clear, until you can click on the next match, games like this never work. Bugs were an interesting addition, but did not make up for problems. Rated 2 out of 5 by iamacat from Yawn Just kind of hang out waiting for all matches made after each move. Boring. Did not finish free time before I deleted. Way to slow! Rated 2 out of 5 by Casombra from It was "ok" Not the best match 3 but it was ok. Not much of a storyline but not really a difficult one to play even with a time factor. Rated 1 out of 5 by campingramps from Picture me yawning This is a real yawner. Very boring and tiring to play. Graphics are ok but that's as far as it goes. I have seen, and played, worse but I can't think of any right now. Bugs added nothing to the game and should have been left out. I don't recommend this one at all even for the match 3 lovers. I wouldn't even waste my time on the demo. Rated 1 out of 5 by babyboomer2013 from I would buy it except I hate bugs! 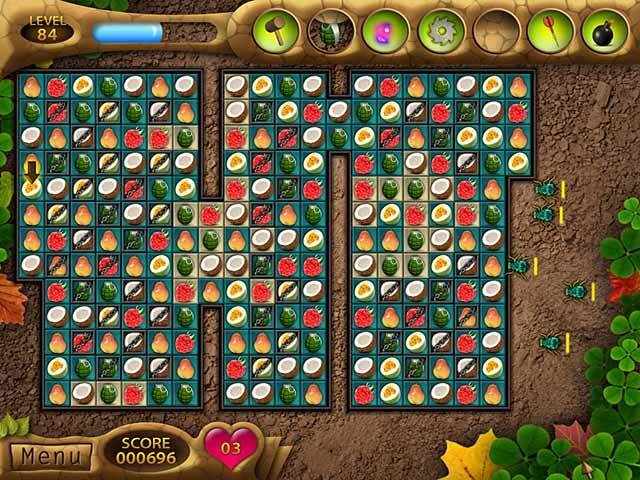 I really enjoy match three fruits and vegetables games, but not with bugs in them. 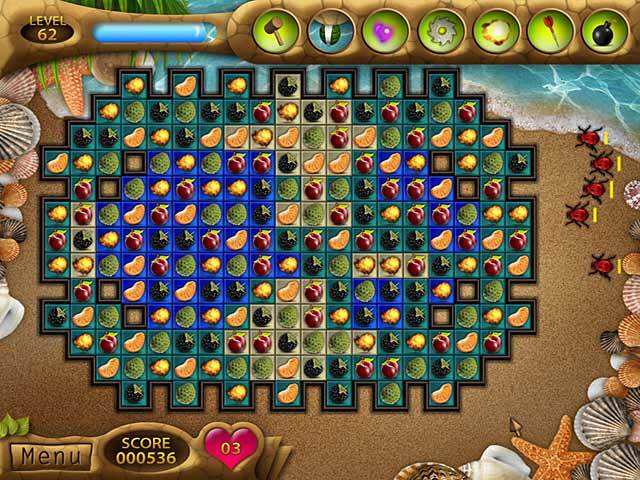 How about creating some match three games with colorful fruits and vegetables without the pests? Thank you. 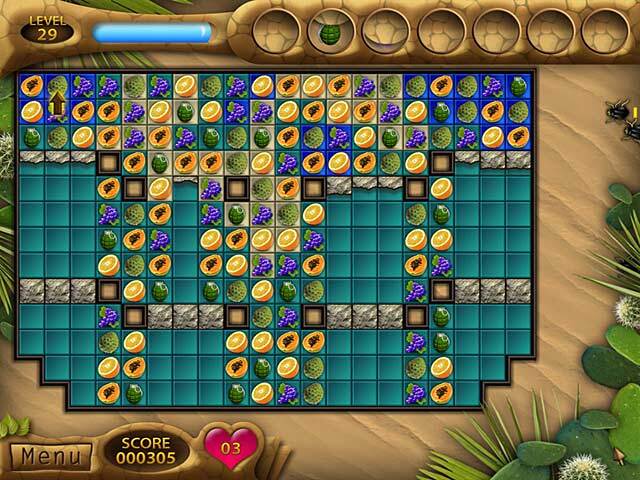 Rated 1 out of 5 by Clavister from Fruit Mania Sorry, but this game is so boring. I think it's just for kids. Rated 1 out of 5 by Spookys_Mom from Buyer's Remorse I read the reviews and said to myself "Not being able to make matches while the tiles are falling won't bother me!" WRONG, those famous last words. The timer is ticking, the bugs are advancing and you are frozen and can't do a thing until all the tiles quit falling! Which unfortunately takes quite a while sometimes and you are clicking, clicking, nothing is happening and you are getting more and more aggravated. My only defense is I was so hungry for a new match 3 that I thought something was better than nothing. Not the case here; nothing is better than something that is a waste of your money since you reach a point where you just stop playing. Too bad it really could have been a good game! Rated 1 out of 5 by IBGordon from Worst title I've ever loaded from Big Fish Play is slow and clunky, and this title is DEFINATELY not ready for prime-time. Removed it after 10 minutes of play,, yes it's that bad! 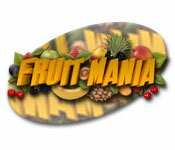 Rated 1 out of 5 by goldengirl2002 from Fruit Mania Don't recommend- Booooring!!!! Rated 1 out of 5 by chessiedora from Terrible! One of the worst M3s I have ever played. The cursor is clumsy and, the fact that you must wait until all tiles have fallen before you can move again make it very frustrating. I am surprised it was even offered by BFG.